Advantage Lewis Hamilton, the Briton having a smooth Friday while Mercedes team-mate Nico Rosberg missed out on his qualifying-simulation run and didn't look pleased as he headed for the team hospitality unit at the end of the session. I'll be back tomorrow at 10:30 BST to bring you live coverage of final practice and qualifying for the Singapore Grand Prix. Until then, it's good afternoon from me. See ya! Andrew Benson's developing second practice report. We'll have highlights of the session, which will include Pastor Maldonado's crash, on the website later today. It's going to be a long night for Lotus as they get to work fixing Pastor Maldonado's battered car. There'll be some number crunching over at Williams, too, I'm sure, with Felipe Massa and Valtteri Bottas down in 17th and 18th. Williams tend to run heavier of Friday, so it's not such a massive shock not to see them at the top of the charts but it does look like they're going to struggle to contest the podium this weekend. Don't take too much notice of Nico Rosberg's finish down in 13th as he had to abort his qualifying-simulation run when the red flags came out for Pastor Maldonado's shunt. Lewis Hamilton finishes fastest in second practice for the Singapore Grand Prix around the streets of Marina Bay. Big slide for Fernando Alonso out of the final corner, a proper four-wheel drift, which is well held. The Spaniard is second quickest, one tenth off the pace. Sebastian Vettel goes fifth fastest on the super-soft tyres with his first flying effort of the session. His time of 1:48.115 is six tenths of a second off the pace. Everyone is out on track apart from Nico Rosberg and, of course, Pastor Maldonado (pictured) who crashed earlier in this session. Marussia: From P19, Max has pulled off on the escape road, having been asked to stop the car to protect it whilst we investigate a powertrain problem. Good work from Red Bull to change that engine in time to get Sebastian Vettel out in this session. The German heads out on the super soft tyres with eight minutes remaining. Marussia's Max Chilton has stopped the car after the team inform him he has a turbo issue. They also tell him he has a fire, but there are no flames visibly licking up from the Marussia. Sebastian Vettel has his helmet on and is in the garage as his mechanics put the final bits back on his Red Bull. He should be back out shortly with 12 minutes to go. Lewis Hamilton is up to 16 laps in this session, which is five fewer than his Mercedes team-mate Nico Rosberg. Esteban Gutierrez has done the most laps with 25 on the board. Red Bull are still busy trying to get Sebastian Vettel's car ready in time for the German to get at least some running in this session. Just 20 minutes to go. Don't expect the current standings to change to much in the closing stages as most have switched their attention to high fuel long-runs. Lewis Hamilton leads the way from Fernando Alonso. Here's how they stand with half an hour remaining. Next time around, Fernando Alonso improves to a 1:47.623 to go second, just over a tenth off the pace. Lewis Hamilton still leads the way, with Daniel Ricciardo third and Kimi Raikkonen fourth. Interestingly, Fernando Alonso can't beat his Ferrari team-mate Kimi Raikkonen (pictured) on his qualifying-simulation run, the Spaniard slotting into fourth, a few thousandths adrift with a 1:48.062. Lewis Hamilton loses a bit of time behind a Caterham, but nevertheless still manages to go fastest of all with a 1:47.490, which is three tenths quicker than Red Bull's Daniel Ricciardo. Nico Rosberg had to abort his qualifying-simulation run when the red flags came out. He's back out again now, as is his Mercedes team-mate Lewis Hamilton. Jeremiah Kariuki: It is Crashtor Maldonado again. Poor guy! Going for race weekends without a crash for him should be a bonus to his earnings. Maxwell Phillips: I know it's easy to pick on him, but has Maldonado had a single weekend this season where he hasn't crashed? Lee Griffin: Surprise surprise, another week another Maldonado crash. When will his money stop putting him (and others) in danger? Lotus mechanics look on in shock as they watch the TV screens showing Maldonado's Lotus swinging around on the crane. A marshal should really be holding on to that car to stop it banging onto the track, as is happening, and further damaging the car. Pastor Maldonado is out of the car, he puts the steering wheel back in and then heads across the track and hops over the wall to safety. It's Pastor Maldonado, the Venezuelan suffering massive oversteer on the exit of Turn 10 and smashing into the barriers and destroying the front right corner of his Lotus. The session has been red-flagged. There's been a crash. Can you guess which driver is in the wall? I bet you can. Sebastian Vettel is sat on the Red Bull pit wall keeping track of the action while his mechanics continue to work on changing his engine. Lotus' Romain Grosjean moves up to seventh with his super-soft tyre run. The difference between the soft and super-soft looks like it's more than two seconds, which is a bigger difference than Pirelli expected coming into the weekend. Daniil Kvyat almost clatters the wall on the exit of Turn 22, but survives to fight another day. The Russian goes fourth quickest with a 1:48.770, one second off the pace which has been set by Red Bull's Daniel Ricciardo. Sergio Perez goes quickest after bolting on the super-soft tyres, the Force India driver clocking a 1:48.653, a tenth quicker than team-mate Nico Hulkenberg. Mercedes make a number of tweaks to Lewis Hamilton's car before sending him back on his way. The Briton was complaining that the car was "all over the place" earlier in the session. Sauber do their qualifying-simulation runs early in this session, with Adrian Sutil and Esteban Gutierrez going third and fourth respectively, so that the Swiss team has plenty of time to focus on the long runs. Mercedes: A completely clean weekend is a rare thing in F1 - no issues to report so far though. McLaren's Jenson Button reports that he is struggling with bad understeer as he peels into the pits. He asks for some more front wing angle at the pit stop before rejoining. Nico Rosberg: "Are you allowed to tell me my team-mate's lap time?" Rosberg's race engineer: "You're three tenths quicker, and that's not to your team-mate [Alonso]." So Nico Rosberg leads the way from Fernando Alonso with an advantage of 0.298 seconds. Here's the top 10 with just over an hour remaining. Valtteri Bottas and Sebastian Vettel are the only two drivers who have yet to set a flying lap. Vettel's sat in the garage while his team change his engine, while Bottas has just headed out on track. Ferrari's Kimi Raikkonen has a moment down at Turn Five when he rides a kerb and destabilises the car. He wrestles back control in time to keep it out of the barriers. The track still looks a bit dusty, which explains why some are struggling for grip. "The car feels pretty bad, something doesn't seem right," says Lewis Hamilton on team radio. "The car is just all over the place." After a slow lap, Lewis Hamilton pops in a 1:50.139 to go quickest of all. However, his time at the top doesn't last long as his Mercedes team-mate Nico Rosberg takes P1 with a 1:49.075. Daniel Ricciardo goes quickest, dragging his Red Bull around the street circuit in a time of 1:50.390, half a second clear of former team-mate Jean-Eric Vergne in the Toro Rosso. Martin Ho: Being attacked by flying degrading tyres! Lewis Hamilton leaves the garage, completes a practice start at the pit-lane exit, and then heads off for his first run of the session. 1) Sergio Perez 2) Nico Hulkenberg 3) Kevin Magnussen 4) Jenson Button 5) Esteban Gutierrez 6) Adrian Sutil 7) Max Chilton 8) Marcus Ericsson 9) Kamui Kobayashi. "There were more tough times for Kimi Raikkonen in first practice. Within a respectable distance of team-mate Fernando Alonso on the first runs, his car developed a fault about which Ferrari were vague but turned out to be a battery problem that meant he could not use full power and ended up nearly two seconds back. He ended it in the pits with the front right brake disc on fire." Kamui Kobayashi has his second spin of the day, the Japanese losing control at Turn Eight, without hitting the barriers, before continuing. "I love street circuits. I won here in 2009 which was a really special experience, plus I had a podium - which should really have been a win - at the first race in 2008," said Mercedes' Lewis Hamilton ahead of the race weekend. "My luck hasn't been great at this circuit since then, but hopefully that will change this weekend." Max Chilton and Marcus Ericsson have headed out on track. The pit lane has opened it's doors to signal the start of second practice. It's hot and humid in Singapore with the ambient temperature up at 28C at 21:28 local time. The track temperature is 34. Lewis Hamilton and Nico Rosberg have left the Mercedes hospitality unit and are on their way over to the garage to begin preparing for second practice. Just five minutes to go until we're under way. Jamie Dunmore: Marina Bay looking magnificent. "Daniel Ricciardo has been asked here about the comparison between himself and team-mate Sebastian Vettel, and where the world champion was struggling with the car. The Australian said: 'He's out-qualified me the last three races so he's obviously got to grips with it. My Sundays have been the surprising one; that's been really good. "'What I've had going for me the last few races is the tyre management. I've been able to look after them a bit better. But in terms of pure speed he's up to speed with everything. To the end of the year, whoever's in front is who's in front." The second session is traditionally the time when teams and drivers gather data on long runs - a succession of laps - on high fuel which replicate stints during a grand prix so they can understand how to set the car up for qualifying and the race. Red Bull: The boys hard at work on Seb's side of the garage, switching to his race engine ahead of FP2. So the second session last 90 minutes, as usual, and starts at 14:30 BST. We'll have BBC Radio 5 live sports extra commentary with James Allen in the commentary box. Peter Leung: That time when Charlie Whiting photobombed Katy Perry. Ferrari's Fernando Alonso makes the front page of Spain's Marca newspaper as his frustration grows with continuing questions over his future. is quoted as saying: "I have nothing to say at this moment. Anything I do have to say will be said in a few weeks and there will be people who won't like it, because for once I'll leak what I want in my interest." "Red Bull face a race against time to change Sebastian Vettel's engine in time for him to get out at all in second practice. His engine failed at the end of the first session, and team principal Christian Horner says a change normally takes about three-and-a-half hours. If Red Bull can make that, he should get out for the last half hour of this session. Let's see." Earlier, I asked you which eight F1 drivers have finished on the podium at the Singapore Grand Prix? The answers are, of course, Fernando Alonso, Jenson Button, Timo Glock, Lewis Hamilton, Kimi Raikkonen, Nico Rosberg, Sebastian Vettel and Mark Webber. Force India: You don't get to enjoy this view at every circuit...stunning Singapore! Afternoon all and a very warm welcome to second practice for the Singapore Grand Prix at the steaming hot Marina Bay street circuit in the heart of the city. Fernando Alonso was the surprise pace-setter in first practice, but there's a very good chance the Mercedes of Lewis Hamilton and Nico Rosberg will stretch their legs and regain control in the next session. Sebastian Vettel must be wondering what he has got to do for things to go right for him. The German's engine failed at the end of the first session, which means he won't be ready for the start of second practice. Will he even get out at all? Not long till we find out. See you back here at 14:00 BST. Cheerio. developing first practice report. We'll have video highlights of the session online later today. Good effort from Ferrari and Fernando Alonso, but you have to say Mercedes' Lewis Hamilton and Nico Rosberg remain the two to beat this weekend. Tim Ferguson: Wow, Alonso top in first practice in Singapore. Seriously impressive considering how uncompetitive Ferrari were at Monza. Jesse oteng eric: Topping in free practice is not what matters but being on the podium at end of race. "It looks like an engine problem, a sudden loss of engine oil pressure, which usually means something pretty nasty," says Red Bull boss Christian Horner of Sebastian Vettel's mechanical failure. "It's a Friday engine, not the one he has planned to race with. The engine changes on this car take around three and a half hours, so there's a lot of work to do. It's going to be tough. The biggest loss is the track time and the long run. "Sebastian doesn't seem to have much luck at the moment." It's just under two hours until second practice starts. Sebastian Vettel helps the marshals push his car back to the garage. He's also got a hand-blower to try and cool his stricken Red Bull and limit the damage. It's the first time in seven races that a car other than a Mercedes has managed to top the times in first practice. More bad luck for Sebastian Vettel, who pulls over at the end of the pit-lane. "I think I have an engine failure," says the German. It's going to be a tricky end to the season for the four-time world champion because he's already used his allocation of five engines. When he takes a sixth, he'll get a 10-place grid penalty. He might be OK, though, if the engine that has failed is one which he wasn't planning to run for qualifying and thus the race. Ferrari's Fernando Alonso finishes fastest in first practice for the Singapore Grand Prix. "Those brake discs are designed to run at over 1,000 degrees." Kimi Raikkonen's front right brake is on fire as he pulls into the pit box. Speedy work from the Ferrari mechanics who get a couple of fire extinguishers on it. Mercedes call it a day for this session with 10 minutes remaining. There's a traffic jam down at the bottom of the pit-lane. Jean-Eric Vergne has stopped with the Williams of Felipe Massa and Valtteri Bottas stuck behind him. It looks like Vergne has a problem, so mechanics from both teams run down to assist. Williams mechanics push Massa and Bottas back so they can drive around the Toro Rosso while Vergne is pushed back to his garage. Nico Rosberg has a couple of moments on his latest lap, twice running over the kerbs but continuing. Lotus: The Singapore GP lights are in full effect now as night falls. The cars are shimmering beautifully under the floodlights as darkness falls at Marina Bay. Red Bull's Daniel Ricciardo is the latest driver to have a brush with the wall. No one has crashed yet, though. behind it, and he pushed again his desire for three-car teams in the future. 'We'll know after the next two or three races,' he said. 'It's always been on the cards that if we lose up to three teams then the other teams will run three cars. I think we should do it anyway. I would rather see Ferrari with three cars, or any of the other top teams with three cars than having teams that are struggling.'" Jenson Button is out at last! The Briton completing a flurry of laps with a best of 1:51.241 to put him tenth, a few thousandths slower than his McLaren team-mate Kevin Magnussen. Fernando Alonso pumps in a 1:49.056 to go quickest by 0.122 seconds. Lewis Hamilton is bumped down to second, with Nico Rosberg third and Sebastian Vettel fourth. Lewis Hamilton and Nico Rosberg do a practice start each at the end of the pit lane before heading back out on track with a little under 30 minutes remaining. 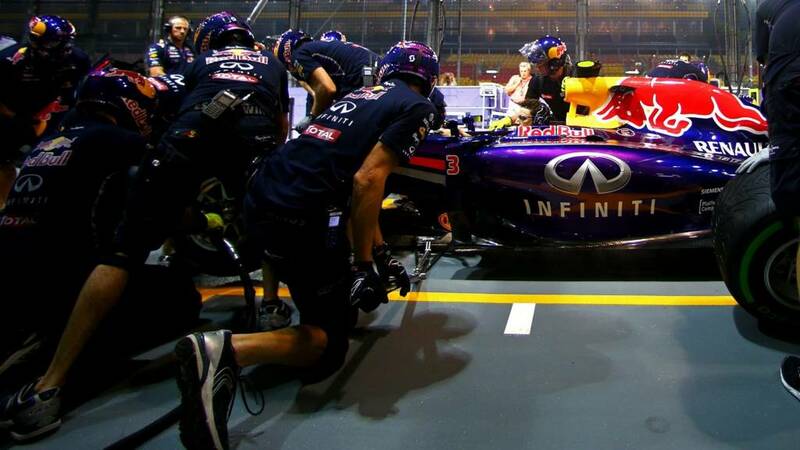 "Check the right hand side," Red Bull's Sebastian Vettel asks over team radio. "I brushed the wall a little bit out of Turn 21." "Only Kevin Magnussen has never driven in Singapore." Phil Slocombe: Lewis needs to keep the pressure on Nico all weekend if he wants him to crack again; made a good start in Practice 1. Bluearmyste: My race result predictions 1st Massa 2nd Hamilton 3rd Vettel. Rosberg crashes out. Tony Walsh: The glow in the dark helmet would be perfect for Le Mans. "He went on to talk about his attempts to build a good atmosphere in the team with football and basketball games and bowling evenings and so on. Vettel, contracted to Red Bull at least until the end of next year, said: 'Obviously I have a contract and nothing has changed,' he said. 'The relationship I have with Red Bull is very special. They have been supporting me since I was 12. I have a very strong link with them and in that regard nothing has changed.'" Oh Pastor Maldonado! That was mighty close, the Venezuelan throws his Lotus through a corner and just catches the rear end before it clatters into the Armco on the bridge section. Good save. He's currently 16th fastest, which is about right in a season which has been thoroughly disappointing. Lewis Hamilton sneaks in front of Mercedes team-mate Nico Rosberg at the top of the timesheet by a few thousandths of a second. Sebastian Vettel is third ahead of Fernando Alonso and Kimi Raikkonen. Still not lap time from Jenson Button. There's an amusing moment when Lewis Hamilton asks his race engineer: "What sector times are other people doing? Are they doing any extra laps?" Of course, his race engineer is no longer allowed to answer that question following new rules on driver advice over team radio. So his engineer replies: "OK Lewis, we'll just continue with our programme and discuss this when we get back in the garage." Lewis Hamilton, Nico Rosberg and Marcus Ericsson have the track to themselves at the moment. Just under 50 minutes remaining. Rae: Glad the FIA have relented. Stop telling drivers how to drive but they need to know technical details about their own car! John Silke: How long till the FIA change the rules mid-race? Nico Rosberg is back out and about and promptly regains his place at the top of the timesheets with a time of 1:50.411. Everyone has set a lap time apart from Britain's Jenson Button and Esteban Gutierrez. McLaren: Back in the garage, and a cooling dry-ice dousing for Kevin Magnussen. Track-walks on a Thursday at the Singapore Grand Prix are a somewhat busier affair. Here, Romain Grosjean and his Lotus mechanics can't hit the apex of Turn One as the track is swamped by spectators having a nose around and taking selfies. It's all quiet at Marina Bay as the first half hour - where drivers can use an extra set of tyres - comes to an end. Sebastian Vettel is our current pacesetter with a 1:50.411, with Fernando Alonso second and Nico Rosberg third. Let's not forget that Red Bull have run well here in the past, winning the last three races at the venue. "The upheaval at Ferrari this season has continued in the last few days, with president Luca Di Montezemolo the latest through the exit door. As Fernando Alonso pointed out here, Di Montezemolo follows team principal Stefano Domenicali and engine chief Luca Marmorini as the ritual blood-letting continues in the wake of the team's worst season for 20 years. "'It's true we are in a big process of changes - Domenicali, Marmorini, now the president,' Alonso said. 'Like all companies, when they change something it is to improve things and I really hope these changes will make a stronger Ferrari.'" Today's Question of Sport teaser is F1-themed: Which eight F1 drivers have finished on the podium at the Singapore Grand Prix. Tweet your answers with the #QSTeaser and #bbcf1 hashtag. We'll publish the eight later today. Good effort from Ferrari's Fernando Alonso, winner here in the infamous 2008 crashgate race, who goes second quickest, one tenth off the pace set by Nico Rosberg. Kamui Kobayashi makes a mess of it down at Turn Five, the rear end of his Caterham stepping out and spinning him round. Luckily for him, he keeps it out of the barriers and soon gets going again. Ana Colina: We love you Lewis Hamilton with all our hearts. Nico Rosberg: "Problem on the upshift up to Turn Five. Big problem on the upshift." "Singapore is definitely one of the highlights of the year," says Mercedes' Nico Rosberg. "There's an amazing atmosphere and the whole city really comes to life for the race weekend. It's just unreal. "I got my second-ever podium here with P2 in 2008 and I generally enjoy street circuits, so I'm looking to go one better this time around." Nico Rosberg moves into P1, the German going three tenths quicker than Mercedes' team-mate Lewis Hamilton. Sebastian Vettel gets about as close as you'd want to get to the wall, before continuing and clocking the third fastest time of the day. Lewis Hamilton is the first driver to cross the line and set a timed lap, the Briton clocking a 1:51.934 before heading straight back to the garage. You know you've achieved when you Madame Tussauds makes a waxwork of you. That honour has fallen to Sebastian Vettel, in his trademark single finger pose, and rival Lewis Hamilton in Singapore. "Sebastian Vettel has a new chassis for this race, after being beaten by team-mate Daniel Ricciardo at the last race in Monza, where he had switched to a different chassis from the previous where he was, you guessed it, beaten by Ricciardo. This has been a bit of a recurring theme at Red Bull this season, with many suggesting there is a bit of a placebo thing going on. "But Vettel unsurprisingly played the situation down. 'It was always the plan to have a new one at some stage,' he said. 'We have been going backwards and forwards, we had the problem in Bahrain and China which turned out not to be a chassis problem but a set-up problem. This is the first opportunity it was to have a new one so we have gone for it.'" Everyone has been out for an installation lap with Nico Rosberg encountering a bizarre issue when his right wing mirror starts flexing and then comes loose. The German asks his team whether he should pit or continue - and his team advise on the latter. However, Rosberg then pulls off the mirror, which is flapping and then chooses his moment before throwing it out of the cockpit. BBC weatherman Ian Fergusson: Circuit radar shows showers 15km W, clearing south... so nothing to trouble the session as it stands. Let practice begin! Mercedes have topped first practice at the last six race weekends, also finishing one-two in FP2 at the last seven consecutive races. While Alonso gazed at his car made of flowers, his Ferrari team-mate Kimi Raikkonen was left pondering whether a half-sized Lego replica of a Ferrari F138 would be faster than his current scarlet machine. Singapore is fast becoming the number one stop on the F1 calendar, but it's one of the busiest for drivers who have a long list of sponsor engagements to attend. One stop of Fernando Alonso's itinerary involved posing next to in front of an organic representation of his Ferrari car, made of Fittonia plants. There's little chance of missing Jean-Eric Vergne in action this weekend as his new helmet design glows in the dark. The Frenchman needs all the help he can get as he searches for a seat on the grid next season after being overlooked by his Toro Rosso team. "Nico Rosberg has had to deal with some negativity but I don't put two and two together and say: 'OK, that means I'm the favourite', or anything like that," says Lewis Hamilton. Read more from the 2008 world champion in his BBC Sport column which is available on the F1 pages right now. James Weir: Another poorly thought through F1 policy change unravels. Still at least Bernie took full credit so we know who to blame! Tim Chatfield: I don't understand what's wrong with race engineers keeping drivers updated throughout, constant F1 rule changes are getting tiring. Craig: You either have the radio and say what you want or don't have it at all, its simple. Don't create more rules. In his Daily Mail column,Nico Rosberg makes some interesting comments about the new team radio rules with regards his team-mate Lewis Hamilton. "It is the right way for the sport to go because it makes the racing pure," says Rosberg. "For example, earlier this season when I was trying to overtake Lewis. "But whenever I went to increase my electronic boost power, which I can only do for a couple of corners, Lewis's engineer did a great job, spotted it and told him to do the same. "Every time I adjusted my settings, Lewis would replicate that, so there was not a difference in performance in our respective cars which never gave me the opportunity to surprise him. But with the new rules that should be over now." "The big talking point heading into the weekend has been the ban on teams giving driving advice over the radio. Some - such as Jenson Button - welcomed it, saying: 'People will make more mistakes, which is good. It's a bit more exciting and in our hands a bit more.' Others - such as Williams's Felipe Massa - were vehemently opposed, feeling that it could lead to major problems. 'The team tells you not to use so much the tyres in corner five, this is OK not to say,' he said. the FIA has split driver advice - which is still banned - from car operation, on which the ban on radio communication has been delayed until next year. Driving coaching is still banned with immediate effect." "5pm and work underway at #SingaporeGP - will work till 1am - so strange to keep euro time! All part of the fun." Mercedes' Lewis Hamilton on Twitter: Really pumped for the #SingaporeGP this weekend. can't wait to get out on the track! So as usual, we'll have two 90-minute practice sessions for you today. The first will take place as the light fades, the second in darkness with the aid of 1,600 light projectors. FP1 starts at 11:00 BST with FP2 following at 14:30. We'll have BBC Radio 5 live sports extra commentary alongside this live text and video highlights online after each session. "This is only the seventh running of the Singapore Grand Prix but already the race has carved its own special place on the calendar. As an event, it is one of the best of the year. The night-time setting gives a special atmosphere, the city is buzzing, there's a slightly unsettling aspect to it in that everyone stays on European team - going to bed at dawn and rising in the early afternoon. And on top of all that the race tests the drivers to the limit. 'It's the toughest we have,' said world champion Sebastian Vettel, who has won it for the last three years. 'It is a very long lap, we have so many corners. It is very bumpy, very rough. The race is nearly two hours long, there is not much time to rest. And the fact it is quite warm, makes it very physical. But mentally it is the toughest race we have because you have to keep your concentration for such a long lap. It is very easy to do a silly mistake and run wide." It's essentially a two-way battle for the title between Mercedes team-mates Nico Rosberg and Lewis Hamilton, although Daniel Ricciardo of Red Bull believes he's still in with a shot. Rosberg leads Hamilton by 22 points with a maximum of 175 (including double points at the finales in Abu Dhabi) still left on the table. Ricciardo is 50 further adrift. here - and also see how things stand in the constructors' title race. Mercedes are running away with it. Ferrari's Fernando Alonso: Good morning! Nice view for breakfast! Now it's time to turn our attention to Singapore, home to Formula 1's first-ever night race, for first practice on the streets of Marina Bay. Morning all, it's been nearly two weeks since Lewis Hamilton snatched victory in the Italian Grand Prix after Nico Rosberg made a mistake under pressure from his Mercedes team-mate. continue his recover at home. The floodlights are in place, the guardrails in position, the stage perfectly set. Let the next act in the Hamilton-Rosberg drama commence.